Discussion in 'Player One - Top Player Picks' started by admin, Apr 1, 2015. Hi PinoyGamers! are you actively posting gaming videos? 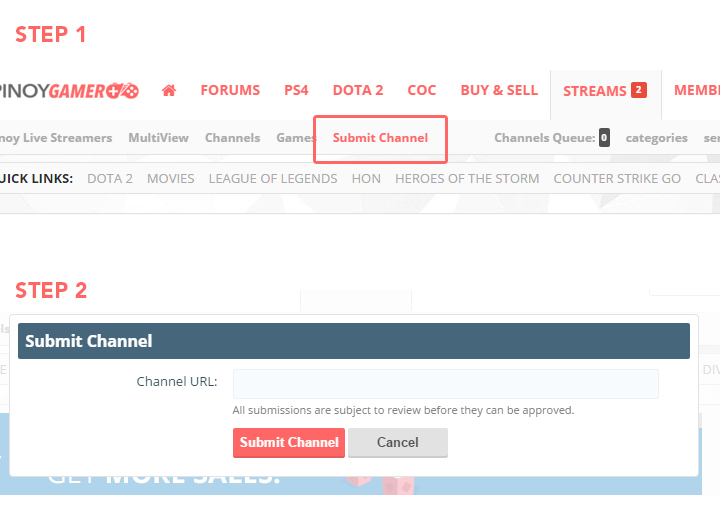 you can submit your twitch or video url's to us and will add it to our video collective so you can reach wider audience! Just keep posting your links below so that we review them! Check out the list below of Pinoy Gamer Twitch Streamers! Sometimes I play games during work so you could expect some random times for me to stream. Example. Wednesday and Thursday I work graveyard shift so ill be streaming lol XD. Hey Harvs here (real name Harvey). I'm 23 years old and currently living and Japan. I'm a Filipino, I mostly speak Filipino but I can speak and understand English and a little bit of Japanese too. I've been watching games on twitch and decided to start my own channel. I stream Hearthstone and play other games too. I am a half Thai and half New Zealander who was born and raised in the Philippines. I work as a freelance graphic artist and commercial model but I always make time for my streams! I only started streaming at the start of October 2015. If you want me to understand you then please speak English or Tagalog (Philippine language). I'm friendly and down to earth so do not be scared to talk to me and be friends! And yes I made all the graphics on my Twitch page. I thoroughly enjoy making my page look beautiful for you guys! Sup! I'm Jay! Formerly Diamond 1 here in the Philippines during Season 5. I'm looking forward to streaming my Gameplay and a whole lot more.. I'm just starting so please be kind >.< Any criticism is welcome good or bad I know my Channel is Soooooo Bad at the moment. But I'm gonna work on this really really hard. For now I'm just gonna test Streaming, play around with settings and just enjoy.I hope you do as well! What up Guys! Welcome to Efraim Ray TV. Here you can find some Awesome and Hilarious Gaming, Anime Reviews, Blogs and Gadget Reviews, Tutorials and many more. Also I've just started to make this youtube channel so Please help me subscribe and promote it to everyone hahaha!... well Thanks Guys and. ENJOY! Fun Fact: I speak three languages: English, Tagalog, and Ilocano. I'm a Filipino-Chinese who's just trying out streaming in the Philippines! With an excuse on trying to improve my English while playing games I loved since a child! Since I just realized I'm typically just playing games on the PC on night and downloading stuff while asleep, I decided to stream to record my gameplay. I have big dreams like being a doctor or a lawyer, but my parents insisted me to becoming a streamer/youtuber so here I am trying to work things out, cheers! Video Games are my passion and working to make my way up as a video game streamer. I enjoy interacting with viewers as they come to the channel. Just drop a friendly "yo dawg" in the chat and I will chat with you. I enjoy meeting new people making new friends (feeding trolls are a favorite pass time of mine). Hello, I would like to thank each and every one of you that come into my stream from where ever you are! It does mean a lot to mean that you take the time to come in and watch me! I am a competitive Counter-strike Global Offensive player. If you have any other questions feel free to ask in the chat! Hi everyone! My name is Sam also known as Evenlir and I just started Twitch two months ago. I play competitive Counter-Strike and I play a variety of games. I stream everyday when my schedule allows it. Feel free to check out my channel! I'll check all your streams out as well. Currently based in the Philippines, and I'm on PLDT Fibr 50mbps. I'm primarily a console gamer, so you'll be seeing a lot of PS4 content (xbox one coming soon!) whenever I'm live (usually weekends). This is my own little way to boost console gaming in the country. hi @animaxx will take note,. Hi. Twitch streamer dn ako. hi guys! im thinking of adding a streaming page for the site however content is scarce so any of you are doing live streaming pls post your stream link or twitch profile below i will add them on our upcoming streaming page, thanks! Thanks @Pathra ill add this on our video section! Cool list updated! to those who are on the list dont forget to share! hi twitch streamers kindly post your schedules so i can add them on the list!